My husband and I were going back and forth on a third child for a long time. I knew that IF we wanted a third, I wanted more space between potential kid three than the less than 19 months we’d had between the first two. We both wanted a third kid — but did we want a third kid? Could we handle a third kid? And we decided that, what the heck, we wanted three kids even if we know that the next couple of years would be, shall we say, challenging, with three kids 4 and under. Cut to: Me falling asleep on the couch while the kids were napping one Saturday. “That was weird,” I thought. Cut to: Me taking a pregnancy test the next night. Cut to: It being positive. And as soon as I saw that positive? I knew that yes, I did in fact, really want a third child. Sure I had a moment of “Oh my God, we’re having a third” but since then I had many moments of “Oh my God! We’re having a third!” And of course, my husband is thrilled, too. The reaction to the third child pregnancy news is different than the reaction to the first. Most people are very excited (like grandparents). Then you get ultrasound technicians who give you a look like you’re the next Michelle Duggar. Or they find out how old your other kids are and look at you like you’re suuuuper crazy. (Which, I admit, I feel super crazy sometimes.) I have a feeling I’ll be getting a lot of “You’ll have your hands full” comments as soon as my belly really pops and I’m in public with my 2- and 3-year-olds. I already have my hands full. I need to sprout another arm this pregnancy to help me cope when the baby comes. This is my “Eek, holy belly!” face. I look so well rested four years ago. I’ll admit though, it was kind of nice to skip the “mushy mid-section” phase and more or less go straight to looking actually pregnant. Silver lining to not being able to button my pants! 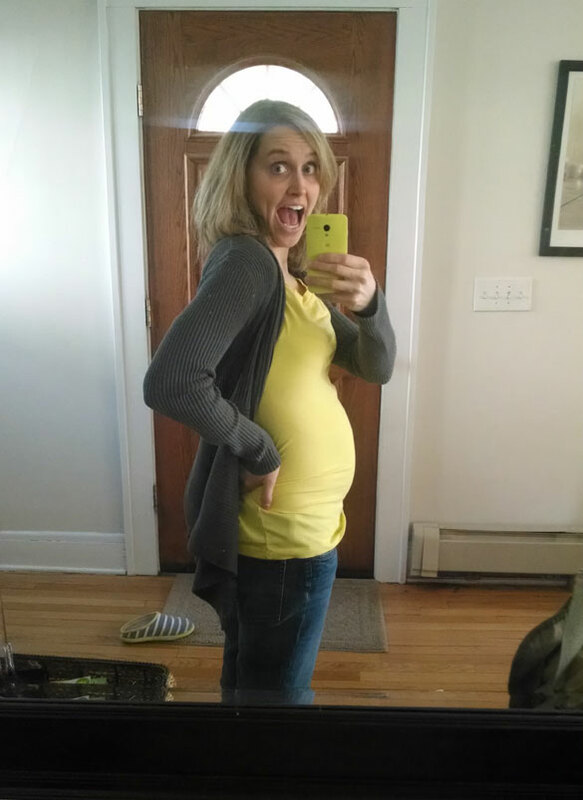 And speaking of pants, I haven’t actually transitioned to maternity yet, but when I unearthed some larger jean sizes I’d forgotten about from my post-pregnancy days, I actually said “OOOOH!” out loud because I was so excited to get into a bigger size. I’ll spare you all of the details of early pregnancy nausea, exhaustion and aversions, and share just a few highlights. The crippling exhaustion had me napping daily when my kiddos slept unless it was a daycare day and I had to work. The nausea wasn’t as bad this go around, but I’m still having some heaving fun now and then. And I’ve gone through a spell where I couldn’t get enough bacon — the real deal bacon — or Claussen pickles. I’ve also been inexplicably drawn to watching Law & Order: Criminal Intent. And workouts? Let’s just say now that my energy levels have picked up again, I’m working on doing more than just getting off the couch! I’m due late September, but given my history of going more than a month early both times, I’ll certainly try to be prepared by mid-August. But I’m really hoping this one will be the one who decides to make it full term and spare us a NICU visit. Congratulations!!! So excited for you and can’t wait for your updates and reviews. Please be reviewing the Body By Trimester series. That’s what I’m doing right now and I think it’s the best set ever! So, three is REALLY crazy…I know, because mine are 10, 8 and 3! The best part for me has been having my older two really experience the joy and humor of pregnancy/babyhood/toddlerdom with me and my husband. I also was showing pretty much immediately but I lost the baby weight so much quickly, too–I think your body is just more primed to get into “appropriate” position by the third time around! Such exciting news! Yay Erin! I was doing my ab exercises this morning, determined to get mine back, so I have a different sort of tummy focus these days. Love to see what you have to share with us on the journey. Congratulations Erin! How exciting for you and your family! Yes, the belly pops so much faster after the first pregnancy. I just had my 2nd and was showing by 10 weeks. Wishing you a healthy pregnancy and easy delivery.